Professor Laila Hlass, an experienced clinical instructor and immigration law specialist, is Tulane Law’s new director of experiential learning. Because the work proved so formative, most of her career since then has involved helping immigrants with legal needs and teaching law students to assist vulnerable populations. A talented clinical instructor — she most recently was director of the Immigrants’ Rights Clinic at Boston University School of Law — Hlass joined the Tulane Law faculty in January. Already-growing interest in immigration law then exploded because of the Trump administration’s executive orders temporarily barring citizens from certain Muslim-majority countries from entering the United States. She’s become a sought-after authority on immigration law while undertaking her new role as Tulane Law’s director of experiential learning. “It’s a really important time for experiential education,” said Hlass, who’s also a professor of the practice. Law firms, nonprofit agencies, clients increasingly expect new graduates to be practice-ready, and students are eager to put their classroom learning to work. In 2016, Tulane Law drew its array of skills-training offerings under a single umbrella with pro bono and public interest partnerships to better integrate opportunities for students to prepare for their careers. Associate Dean Stacy Seicshnaydre (L ’92), a former Civil Litigation Clinic director, heads the team. 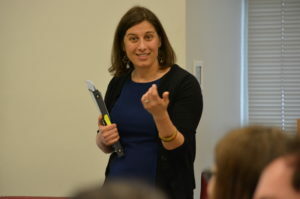 “We want to expand the program to ensure that all students have opportunities that align with their areas of interest and to ensure that there’s enough academic rigor and support,” Hlass said. She grew up in Long Beach, Mississippi, then attended Rice University in Houston. She received her JD from Columbia Law School and an LLM from Georgetown University Law Center, where she supervised students in a legal clinic working with asylum-seekers facing court hearings. She also spent four years at Loyola University New Orleans College of Law, where she assisted in supervising clinic students and pro bono attorneys representing immigrants in state and immigration courts, as well as teaching refugee law. At that time, just a few years ago, Louisiana nonprofit groups had only a handful of attorneys handling immigration cases statewide, she said. The number of attorneys has multiplied, but still there aren’t enough attorneys to serve that population, she said. This entry was posted in Admissions, Classroom learning, Immigration law, International law, Law professors, Pro bono law, Skills training on March 9, 2017 by tlslagniappe.